Here’s a look at our first Thanksgiving week as a married couple. It was hard not getting to spend the holiday with my family, but we still managed to have fun, spend time with friends and family, eat delicious food, and go on a few adventures. I’m thankful that we made such special memories last year on our family vacation to Tucson! To start the holiday off, we went hiking on Tuesday night at sunset and ended up finding 6 letterboxes in the dark. That’s some pretty dedicated letterboxing, right?! We hiked at Ironwood Park in Tucson Mountain park. Despite being called Ironwood park, there’s only one ironwood tree there — the lone tree is pictured below. On Thanksgiving day we had a fun dinner with Curtis’ relatives who have their own special traditions – like substituting turkey for duck! We stopped on the way to Curtis’ cousin’s house and found a letterbox near this awesome bridge built to look like a diamond back rattlesnake. The rattlesnake tail at the end. On Friday, Curtis went for a longer hike up Mount Wrightson with some of his friends. I wasn’t feeling quite up for the elevation, so I stayed home. Curtis should be thankful that I didn’t walk over to the mall and go crazy with Black Friday sales! To wrap up our week, on Saturday we went to Tombstone and Bisbee in Cochise County with our letterboxing friends, Mitchell and Alex. Our goal was to plant 5 new boxes, but we only planted 3 which means we’ll have to take another trip to these towns in the future! The weather was much better than our last trip to Cochise County. We enjoyed the vibrant colors of the golden colored grass contrasted with the blue mountains in the background. It’s also so interesting to me how once we leave behind Pima County, we stop seeing saguaros and other desert plants. This was just nowhere in particular — sometimes we find the most beautiful scenery right along the back roads in Arizona. Mule Pass, right outside of Bisbee. Our time in Bisbee was brief but enjoyable. We’ll be back for sure. We drove through the tunnel into town, parked, and walked around the narrow streets. The guys picked out a restaurant for lunch inside the Bisbee Grand Hotel, then we drove around looking for a place to hide a letterbox. 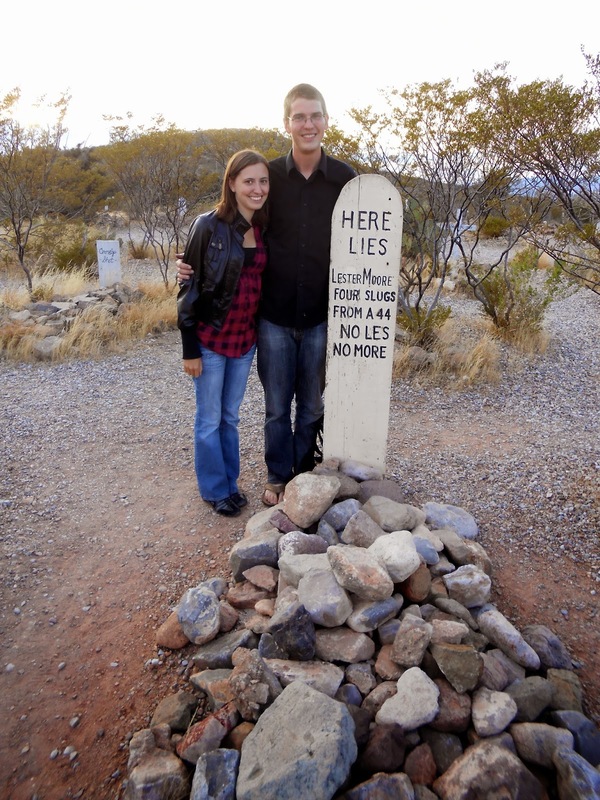 Our first stop in Tombstone was to find some letterboxes in Boothill Cemetery. It was apparent right from the beginning that this town was a kitschy ghost town, but we still enjoyed our visit. What made the cemetery interesting was that they had written how some of the people buried had died. There were a few short poems written on some (like the one pictured above) that were rather amusing. Sunset was fast approaching, so once again we didn’t spend as much time exploring the town as we wanted to. We did find our way into Big Nose Kate’s Saloon for some Sarsaparilla. Finally, we made the long drive back to our home in Tucson.